Akagera National Park is central Africa’s largest protected wetland and the last remaining refuge for savannah-adapted species in Rwanda. The rolling highlands, vast plains and swamp-fringed lakes of this north-eastern territory contain a rich biodiversity and are home to a number of rare species, such as the shoebill stork. With more than 12,000 large mammals and 482 bird species, this breath-taking landscape is every nature lover’s wildest dream. The park was not always a wildlife haven. The1994 Genocide against Tutsis took its toll on the park when much of the land was reallocated as farmland for returning refugees, reducing the size of the park from 2,500 km² to just 1,122 km². The high population density and human encroachment into the park was a pressing issue in the past, but the ongoing efforts to restore animal populations, increased law enforcement and the construction of the fence resulted in a positive impact. With the implementation of rigorous law enforcement since 2010, poaching has been reduced, wildlife has prospered and the tourism industry has been transformed. As Rwanda’s only Big Five park, Akagera provides important opportunities for local employment. This life-giving revenue stream not only strengthens ties with surrounding communities, but ensures the very survival of the park and its wildlife. Akagera is home to rare and elusive species like the sought-after shoebill and swamp-dwelling Sitatunga. Its extensive network of freshwater lakes and papyrus swamps form the largest protected wetland in central Africa. The park is named after the Akagera River that flows along its eastern boundary and feeds into a labyrinth of lakes, the largest of which is Lake Ihema. The rolling hills of acacia and brachystegia woodland, coupled with scattered grassland and swamp-fringed lakes create a park of breathtaking scenic beauty. As of May 2017, Akagera became a ‘Big Five’ park with lions, rhino, buffalo, zebra, giraffe, elephant and hundreds of birds species. Wildlife populations are thriving due to effective law enforcement and successful conflict-mitigation with surrounding communities, with poaching at an all time low in the park. Until lions were reintroduced in 2015, only leopards and hyenas were found in the park. Smaller predators including serval and side-striped jackal , along with iseveral mongoose and viverrid species, are abundant and doing well in the park. Of the primate family, olive baboons and vervet monkeys are common. A far rarer site is the secretive blue monkey, which, until recently, was thought to have become extinct in Akagera. Elephant, giraffe and hippopotamus are amongst the largest mammals found in the park, joining a number of naturally occurring large plains game species including buffalo, topi, zebra, defassa waterbuck, the secretive roan antelope and the statuesque eland. Smaller herbivores present include duiker, oribi, bohor reedbuck, klipspringer, bushbuck and impala. Akagera is an important habitat for the endemic red-faced barbet. Approximately 500 bird species have been document in the park. Akagera is an important ornithological site, with rarities such as the shoebill and papyrus gonolek, which are both restricted to the papyrus swamps, the localised red-faced barbet and the swamp flycatcher. Masai giraffe were introduced into the park from Kenya back in 1986, with the current population estimated at 60 individuals, while elephant, which once occurred naturally in the park, were reintroduced in 1975 and now number about 90 individuals. In 2017, 18 Eastern black rhino were translocated to the park. Every two years, an aerial census is conducted in order to monitor wildlife populations. Several elephants have been fitted with GPS collars as part of a long-term monitoring initiative to track ther movements, learn about habitat-use, and to help overall to better protect them. Rangers conduct monthly road counts in order to gain a clearer understanding of animal densities and distributions. Akagera is the site of a project to rehabilitate populations of grey crowned cranes previously kept as pets in and around Kigali. 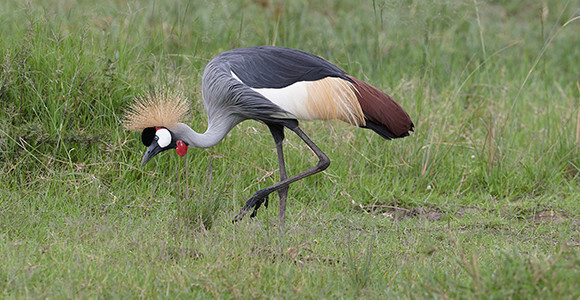 Managed by the Rwanda Development Board, Akagera National Park, and veterinarian, Olivier Nsengimana, it aims to release previously captive grey crowned cranes back into the wilds of Rwanda, where it is estimated that less than 200 remain. A number of rehabilitated cranes have already been released and are breeding in the park.